Last year, ACI assisted in the sale of a retail strip center property at 4422 Euclid Avenue in San Diego’s Mid-City neighborhood. The goal of the buyer side of the transaction was to redevelop the site and incorporate a mix of retail and affordable residential units for seniors. This week, the San Diego Business Journal published an article about the completed construction of the new facility. The article by Lou Hirsh was originally published by the San Diego Business Journal an can be found HERE. 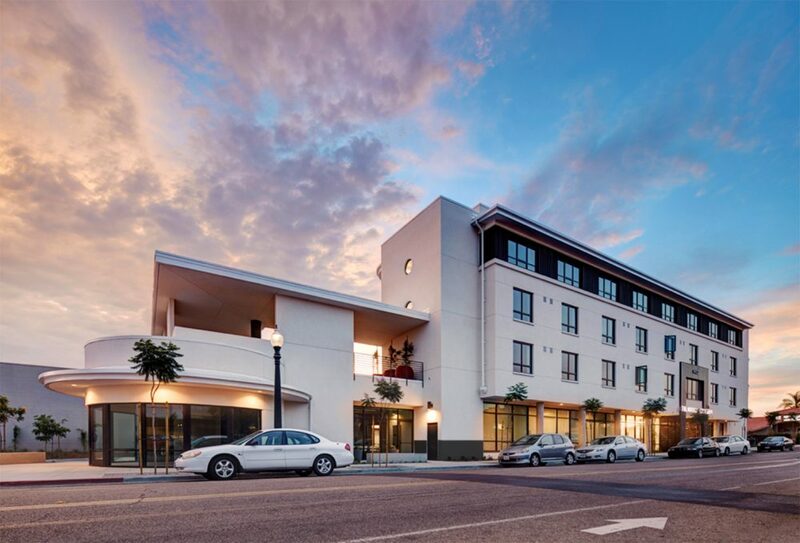 San Diego — San Diego-headquartered Wakeland Housing and Development Corp. recently completed Talmadge Gateway, a $20.7 million, 60-unit supportive housing community geared to homeless seniors at 4422 Euclid Ave., in the Mid-City area of southeastern San Diego. The project was built by Allgire General Contractors of Carlsbad, and designed by San Diego-based Studio E Architects. A Studio E statement said the three-story building includes micro-unit apartments — 350 square feet in size — served by ground-floor meeting rooms, offices, lounge areas and on-site supportive care services. There is also a second-floor terrace for exercising and socializing. In Kearny Mesa, San Diego-based developer Sunroad Enterprises recently opened the 302-unit Vive on the Park, a luxury apartment complex at 8725 Arriva Court, within the larger Spectrum Center mixed-use development. Construction on the seven-story Vive started in 2015 — among the latest in a multiproject apartment neighborhood by Sunroad — and the finished complex includes rooftop lounges, dining decks and a multilevel fitness center. Sunroad did not disclose the cost of the apartment project, but said the company is investing $1 million into developing an adjoining two-acre public park, set to open in spring 2018. Spectrum Center is a 240-acre campus — including about 40 acres developed directly by Sunroad over the past 17 years — that now contains numerous office and apartment buildings built by various developers, in an area running from state Route 163 east to Ruffin Road. This area once housed a sprawling missile production plant operated by General Dynamics, which shut down in the 1990s. The acreage is now home to operations of several prominent companies and other entities, including Sharp HealthCare, Northrop Grumman Corp., National University and Jack in the Box Inc.